This is the main view with the acquired SafePages since the last login. This view is also known as “inbox”. An action button that opens a pop-up menu. For now, the SavaPage logo with the GDPR and About button is available. See Section 3.12, “GDPR Dialog”. The Community Member name, in our case "SavaPage Demo". Pressing it opens the About dialog with version and copyright information. A button with the inline pagometer Pie-Chart followed by the id of the logged in user. The blue color in the chart represents the number of pages the user printed to SavaPage. The green color represents the number of pages exported to PDF. The red color depicts the pages printed to Proxy Printers. The button opens a dialog with User Details, including pagometer details. The Help button opens a custom URL in a new tab. The URL is set with configuration property "webapp.user.help.url" and enabled with "webapp.user.help.url.enable" Y (default) or N.
The i button opens the About dialog. The two-line center bar holds buttons for the main work-flow. When no SafePages are present, the SavaPage logo is shown, and irrelevant buttons are disabled (these buttons are described at Figure 3.10, “User Web App: SafePages”). By default, the center bar shows button text on mobile devices only: on desktops a hover text is shown. You can change this behavior by setting configuration property webapp.user.main.nav-button-text with value ON (button text is always shown), OFF (button text is never shown) or AUTO (button text is shown on mobile devices only). See Section 4.10.14.11, “Config Editor” on how to change configuration properties. Depending on User Privileges and User Roles some buttons might not be shown, replaced (relocated). 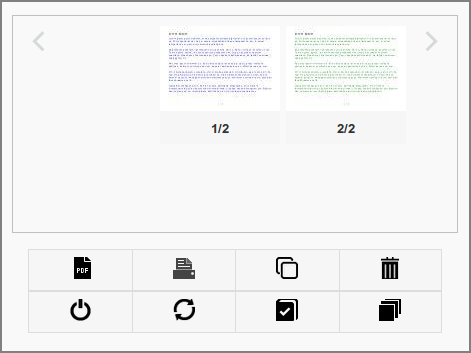 The Letterhead button brings you to a dialog where you can create, browse and select letterheads. See Section 3.6, “Letterheads”. Press the Log button to get a list of the See Section 3.8, “Log”. The Logout button brings you back to the login screen. Press the Refresh button when, due to whatever reason, the automatic detection of SavaPage changes fails. This will update the view with the latest state. Each print to SavaPage is logged as Document. SafePages that do not match a logged Document are removed. This can happen when a database is restored, or when old documents are deleted after a Database Backup, or Database Command. You can scroll through the thumbnails by dragging them horizontally. A tap on the transparent area "<" or ">" in the top corner of the thumbnail view port scrolls the view a single page to the left or right. A taphold brings the start or the end of the page range in view. A tap (click) opens up a detailed view of the page in the Page Browser: Figure 3.19, “User Web App: SafePage Browser (8 pages)”. A tap on the page number underneath the thumbnail or a taphold on the thumbnail itself, opens the Document Details dialog with rotate, delete and undo actions: Section 3.3.3, “Document Details”. When the user is a Job Ticket Creator and not a Print Job Creator, or Job Ticket Printers are the only available printers, a Ticket button is shown instead of a Printer button. Section 3.5, “Print”. This screen shows the result of a user printing 8 pages to the SavaPage printer, and illustrates thumbnail aggregation. Note that only 6 thumbnails are displayed, and that the first thumbnail tells by its numbering that it is the first of a (3) page aggregation. A tap on the first thumbnail will bring the (3) aggregated thumbnails in view. As a side-effect an aggregate will appear at another location in the thumbnail sequence. Thumbnail aggregation is a protection against information (and resource) overload. Imagine what would happen if you printed a 500 page document to the SavaPage printer and ended up with 500 thumbnails. Aggregation gives you the high-level means to easily zoom in and out. As always, a tap on a single thumbnail will bring you to the Page Browser, where you can navigate to any page, sequentially or directly. See Figure 3.19, “User Web App: SafePage Browser (8 pages)”. 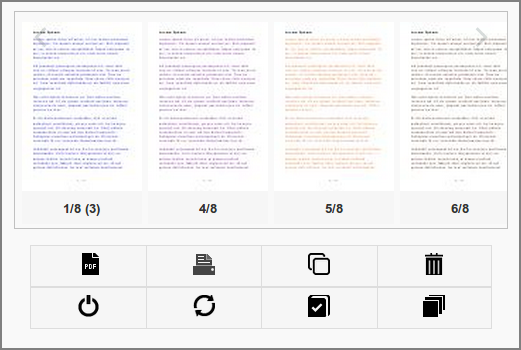 When the document expiration time signal is set and expiration for a document is due, every thumbnail of the document is marked with a clock icon in a colored (orange) footer. When the document is auto-deleted after expiration a notification message us shown. The footer is positioned at the bottom of the main user panel. The base items are depicted in the figure below. A check-mark icon as indication that the Web App is connected to the SavaPage server. Other icons are shown when the connection is being (re) established or lost. When the server is not down, this usually is a temporary condition due to a network hiccup. Don't worry, SavaPage will automatically restore the connection when the network permits. The account balance of the logged in user. When you press the button a dialog with User Details is shown, including pagometer details. This button might not show depending on Financial User Privileges. A tap on the Upload button shows the Upload File dialog. This button may have moved to the center button bar, depending on User Privileges. Depending on User Privileges some buttons might changed, not shown or moved to the main button bar. When SafePages are present the unique paper sizes of the jobs are depicted in the footer. 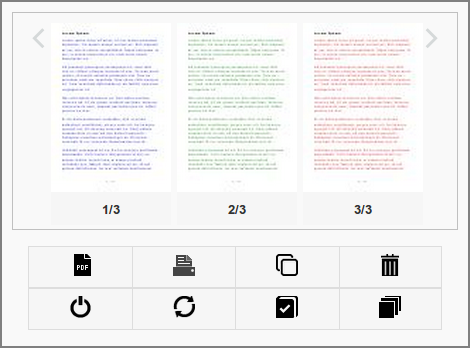 The text color indicates if a paper size is supported by the selected printer or not. The examples below illustrate how this works. A4 and A3 jobs are present: a printer is selected that supports both paper sizes. 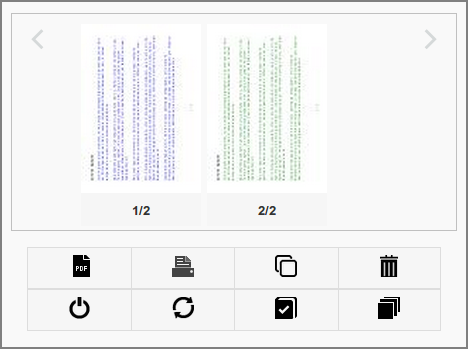 A4 and A3 jobs are present: a printer is selected that supports solely the A4 paper size. The A3 page is cropped to A4. A4 and A3 jobs are present: a printer is selected that supports solely the A4 paper size. The A3 page is shrinked to A4. A4 and A3 jobs are present: a printer is selected that supports none of the paper sizes (or no printer is selected yet). 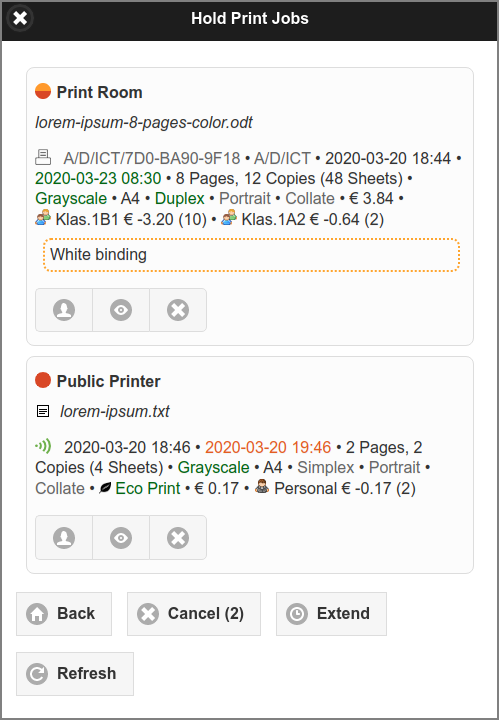 A summary of Hold Print Mode jobs and Job Tickets as a result of Proxy Printing is shown in the footer. The example below explains the layout. The shortest remaining job release time. The total number of hold jobs. The total number of pages to be printed. The total cost charged for printing. Preview the PDF document to be printed. 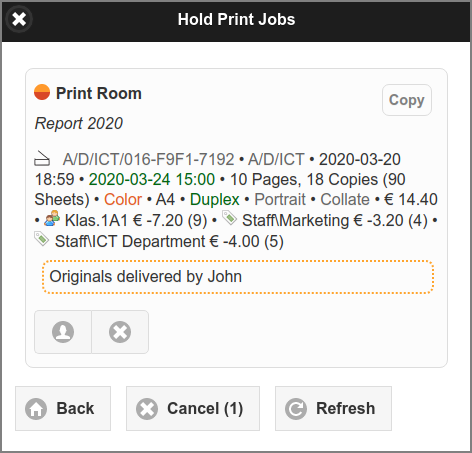 Extend the expiry time of Hold Print Mode jobs. Section 3.5.5, “Print Job Settings”. Section 3.5.9, “Job Ticket Print”. 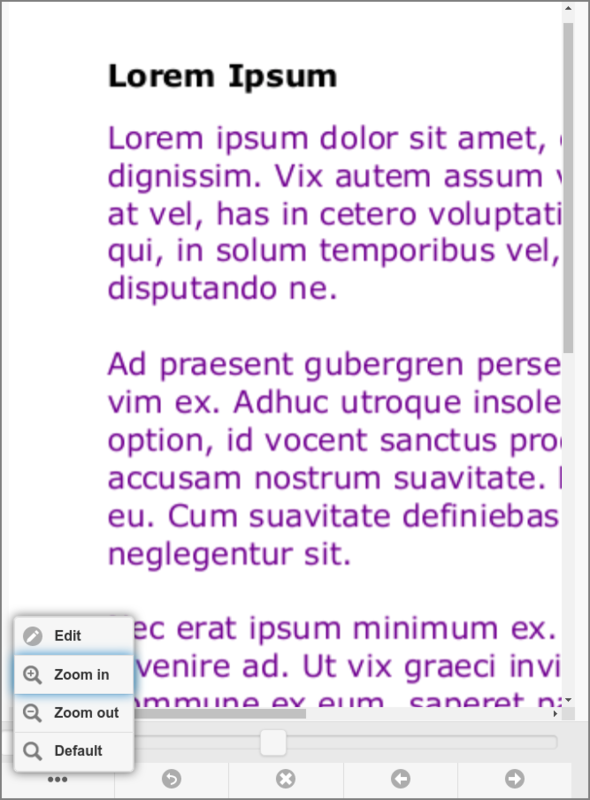 A Tap on the page numbering below the image pops up the Document Details dialog. When document expiration is set the expiration time is shown. See Section 4.10.14.8, “SafePages”. Press the Delete document button in this dialog to delete all pages of a SafePages document, or check and apply Undo page delete to restore the full job in case document pages were deleted. See Section 3.9, “Sort”. When a user prints to a printer and selects landscape orientation, the print manager of the originating application will translate and rotate the printed content to fit the dimensions of the hard copy target page. When doing so, it makes assumptions about the (0,0) origin of the logical space on this page. 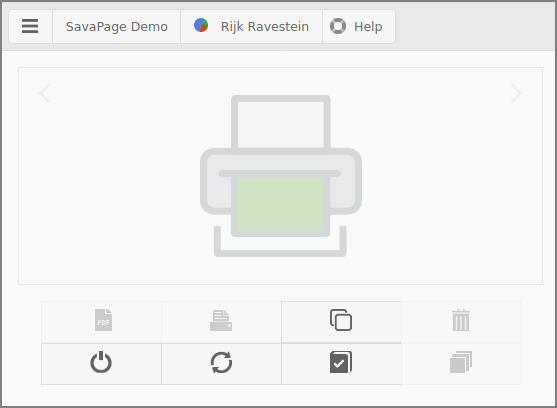 The SavaPage printer driver provides a hint to the print manager about the origin, so it can rotate and translate the pages in a way that is compatible with the SavaPage printer. Contrary to real printers, where hard copies can easily be rotated by hand, pages produced by the virtual SavaPage printer need special attention, since landscape oriented prints will display rotated in portrait oriented images and PDF pages. Probably this is not what you want, so you can ad-hoc rotate job pages in SavaPage to landscape display orientation. This what you might see when you print a job in landscape orientation. 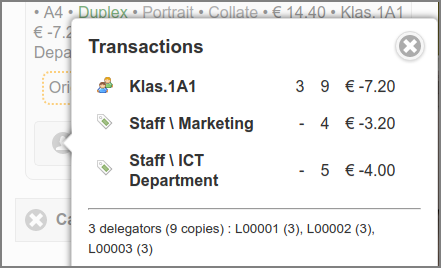 Select the Rotate option and press the Apply button to rotate the page and all sibling pages belonging to the same job. The result after rotation is shown in Figure 3.18, “User Web App: Rotated Pages”. Although the Rotate dialog is triggered from a single SafePage, the rotation affects all SafePages within the same print job. When two WebApps are opened for the same user, the result of a page rotation performed in one Web App will not automatically be shown in the other. The user should do a manual refresh to update the SafePages preview. A tap on a non-aggregated SafePage thumbnail image will show the page detail in the Browser. A tap on the page image zooms in, extending the image width to the available screen width. See Figure 3.20, “User Web App: SafePage Browser - Detailed View (4 of 8)”. Swipe the page image to the left or right to view the next or previous page. A swipe-left on the last page brings you back to the first page. Vice versa, a swipe-right on the first page brings the last page into view. The arrow-right and arrow-left buttons in the navigation bar below are an alternative for swiping to a next or previous page. 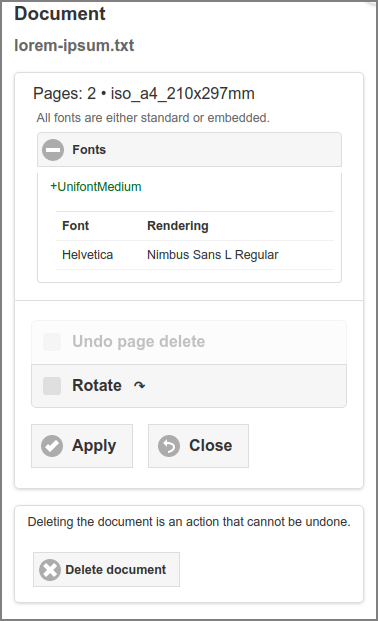 Use the slider control to directly jump to the page of your choice. The X button deletes the page in view. The leftmost Return button brings you back to the main SafePages screen: Section 3.3, “SafePages”. This screen shows a zoomed-in detailed page view. The image width is extended to the available screen width. Use the standard page scrolling of your browser to scroll the image up and down. 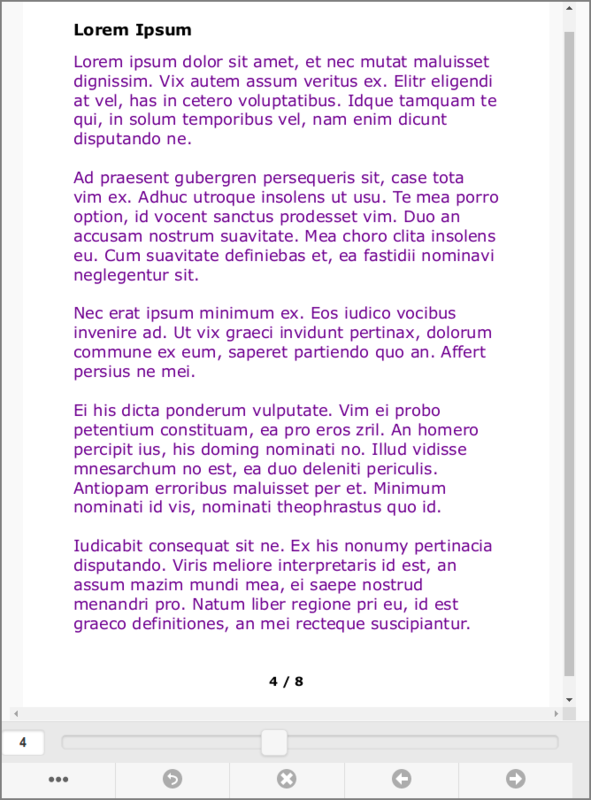 A tap on the page image zooms out again, adjusting the image height to the available screen height. See Figure 3.19, “User Web App: SafePage Browser (8 pages)”. The detailed view automatically adjusts itself when the available screen width changes, either by tilting your mobile device from portrait to landscape orientation (vice versa) or by resizing your desktop browser window.